John Steinbeck’s story of dashed dreams in fraught times remains as potent as ever. This is most evident in the fact that though cherished by many, Of Mice and Men also occupies fourth position on the American Literacy Association’s list of Most Challenged Books. Like the novel on which it is based, Tanith Lindon’s production pulls no punches. Two migrant ranch-hands, George (Tarl Caple) and Lennie (Adam Diggle), wander the plains of America looking for work during the Great Depression of the 1930’s. Together they have a goal; to save enough money to buy their own homestead and ‘live off the fat of the land’. But when they arrive at the next farm where they find employment, they encounter Curly, the tightly coiled and violent boss’s son (David Aldridge), and are tormented by his isolated, beautiful, and flirtatious wife (Ariel Harrison). It doesn’t take long before a series of unfortunate events derail their fantasy just when it is on the verge of coming true. For a large part of the production very little happens; the relationship between George and Lennie is gradually developed against a backdrop of guarded conversations and unvoiced suspicions. The characters share a sense of quiet misery and Lindon evokes an underlying sense of unease, which builds in an excruciating crescendo towards the play’s tragic conclusion. The dialogue is delivered in a suitably measured fashion with the pauses drawn out to accentuate the tension. Designer Jess Bennett uses clutter to create an air of dilapidation: rudimentary wooden creates, dusty cloth sacks, and cracked and splintered plank walls enhance the sense of claustrophobia in what is an already cosy performance space. As a result, when the piece does explode into action, it’s very effective, the fight scenes expertly orchestrated by choreographer Chris Wynn. 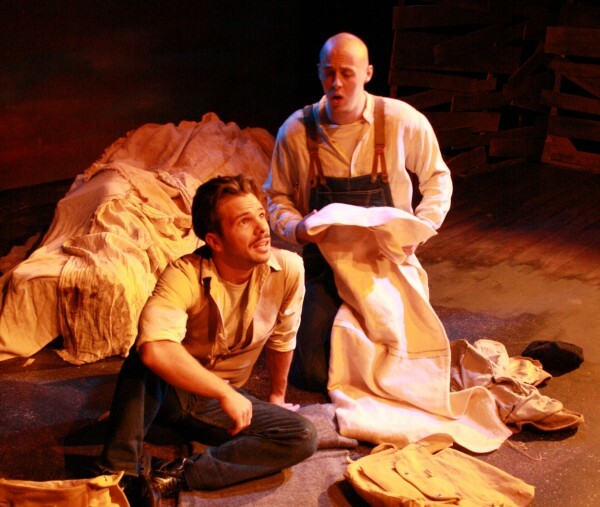 A strong cast help convey Steinbeck’s broken social scene. Harrison dances between desperation and determination as Curly’s wife, coming across more as a woman who is perilously unhappy rather than scheming. Aldridge is suitably sneering and domineering as Curly, but it is Caple and Diggle who really stand out. Caple conveys George’s long-suffering and steely demeanour but also hints at his compassionate and optimism, whilst Diggle hits the right balance between playful child and fearful adult in his portrayal of Lennie. Despite the often frustrated relationship between them, Caple and Diggle really evoke a sense of kinship between the two men and this is instrumental to the impact of the play’s ending. There are a couple of weak moments (the use of a soft toy to stand in for Lennie’s puppy is unfortunate – and a source of unintended laughter) but they do little to detract from the play’s devastating conclusion. You may know what’s coming, but the two actors wring all the emotion they can from the final scenes, building to a finale that is guaranteed to leave the audience more than a little moved.